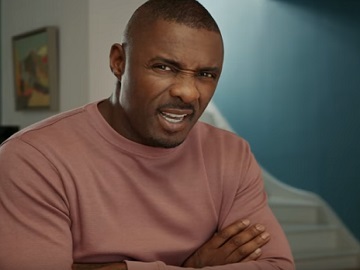 Sky has released a brand new TV advert featuring Idris Elba to emphasize that with Sky TV you can enjoy a fantastic range of entertainment including the final season of Game of Thrones and family favourite Incredibles 2. The 60-second spot features the actor as an unseen guest in the home of a grandfather who spends the afternoon with his granddaughter, named Molly. Despite saying she’s ok, the girl is obviously not ok and Elba notices that, too. Her granddad manages to change her mood by using Sky TV. Using magic – aka voice control, he changes the channel, choosing the Incredibles 2, pauses the movie before going into the kitchen to have something to eat, and picks it up in the kitchen from where they left off. Back in the living room, they take on a portrait challenge, along with other art class students in a TV show and draw portraits of each other (Elba draws his own portrait, though). Later on, before leaving with her mom, the little one hugs her granddad and thanks him for the quality time spent together. “Believe in a little bit of magic every day. With all the best shows at the tip of your thumb,” says the voiceover at the end of the advert, which also sees the grandfather saying “Winter is coming” at his microphone. The spot also informs that Sky TV requires Sky Q box, Sky TV & Q Experience subscriptions and Sky Q Mini(s) connected to home broadband, and that content depends on subscription. This is not the first time Elba stars in a Sky advert. In 2017, he fronted a campaign for Sky Q, showcasing its features. The Hollywood A-lister appeared in several spots focused on various capabilities of the Sky Q 2TB box, such as the capacity to store over 1,000 hours of TV and record 6 shows while you watch a 7th, the capacity to help you find the remote in case you lose it, the possibility for users to search for their favorite shows with their voice, watch sports, movies, dramas and documentaries in Ultra HD, pause what they’re watching on their TV and pick up where they left off in another room, on their TV, tablet or mobile.